7 110/80-14 59S Rear Мотошина 110/80-14 M/C 59S TT REINF CITY PRO Rear MICHELIN BT637986 3 2 970 руб. 12 120/80-16 60S Front/Rear Мотошина 120/80-16 60S TL/TT City Pro Front/Rear MICHELIN 1123555/07 2 3 500 руб. 12 2.25-17 38P Front/Rear Мотошина 2.25-17 38P TT REINF City Pro Front/Rear MICHELIN 1123555/10 2 2 280 руб. 12 2.50-17 43P Front/Rear Мотошина 2.50-17 43P TT REINF City Pro Front/Rear MICHELIN 1123555/09 2 2 850 руб. 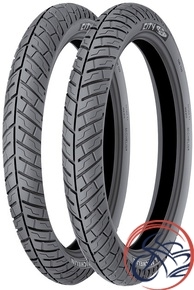 12 2.75-17 47P Rear Мотошина 2.75-17 47P TT REINFCity Pro Rear MICHELIN 1123555/11 6 3 100 руб. 12 2.75-18 48S Front Мотошина 2.75-18 48S TT REINF City Pro Front MICHELIN 1123555/01 5 3 180 руб. 12 3.00-18 52S Front/Rear Мотошина 3.00-18 52S TT REINF City Pro Front/Rear MICHELIN 1123555/03 12 3 300 руб. 5 3.00-18 52S Front/Rear Мотошина 3.00-18 TT M/C 52S REINF CITY PRO Front/Rear MICHELIN BL589411 2 3 440 руб. 12 3.50-16 58P Front/Rear Мотошина 3.50-16 TL/TT M/C 58P REINF CITY PRO Front/Rear MICHELIN 1123555/08 1 2 800 руб. 5 3.50-16 58P Front/Rear Мотошина 3.50-16 TL/TT M/C 58P REINF CITY PRO Front/Rear MICHELIN BL445718 2 2 940 руб. 12 90/90-18 57P Front/Rear Мотошина 90/90R18 57P REINF TT City Pro Front/Rear MICHELIN 1123555/05 1 2 890 руб. 7 90/90-18 57S Front/Rear Мотошина 90/90-18 57S REINF TT City Pro Front/Rear MICHELIN BT859919 3 2 890 руб.